Of all the facets of diving, decompression theory is perhaps the least accessible. It can be a minefield of dry scientific jargon and complex principles, which often leave the reader wondering why on earth they thought it would be a good idea to learn more about it! To make things worse, the scientific researchers currently studying it are the first to admit that we know very little about it. That doesn’t really bode well for the rest of us mortals. Yet it is a fascinating part of diving that underpins everything we learn to try and be safe divers. So here’s my attempt to make this subject a little more reachable, and hopefully more entertaining. But it’s a huge subject area, and merely outlining the principles will take a few articles. So here goes. 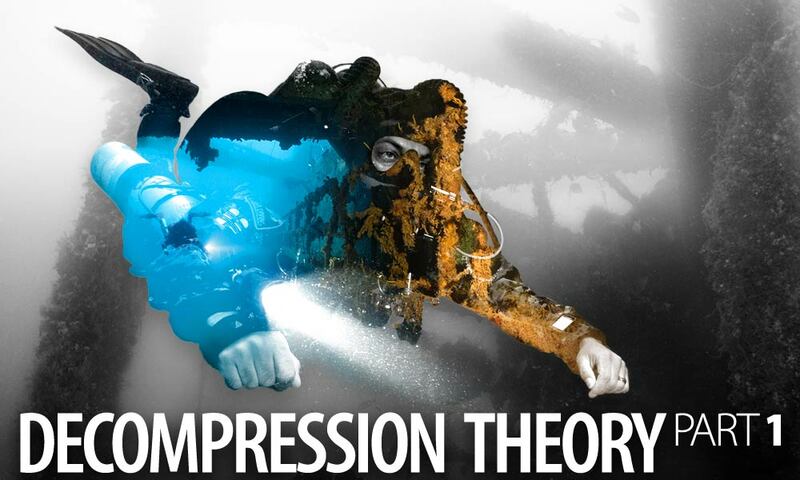 There is a common misconception within the recreational diving community that decompression theory is a well understood process. Whilst our understanding as applied to non-decompression dives within the 30m limit seem to work well for most people (DCS cases vary between 10-20 in every 100,000 dives), DCS can manifest after a dive within conservative limits. Go beyond the recreational limit and you are basically a guinea pig to decompression research. Before going into on- and off-gassing, it’s probably a good idea to outline the basics of why we need to breathe underwater in the first place. The simple answer is because we need to breathe on land obviously. But why do we breathe? What exactly is happening as we do so? Forgetting about diving for a moment, on land the air we breathe contains a mixture of roughly 21% oxygen (O2) and 79% nitrogen (N2). It’s actually 20.55% O2 and 78.08% N2 by volume, with less than 1% of the rest being comprised of Argon, Neon, Helium, Krypton, Hydrogen, Xenon, and Carbon dioxide. However, because these gases exist in the atmosphere in such small amounts, we just bundle them in with N2, and they are considered “inert”, meaning that chemically and biologically they do not react with our bodies (at the surface). Breathing is an autonomic process, but we can override it to a degree. When we want to breathe in, the external intercostal muscles of the ribcage contract, and the internal intercostal muscles relax. This pulls the ribcage up and out, and the diaphragm down and away from the lungs. This reduces the air pressure in the lungs, so air is drawn in. The opposite happens when we breathe out, which causes air to be squeezed out of the lungs. On inhalation, air going into the lungs mixes with gases that are already in the lungs. This means that the proportions of each gas in our lungs are slightly different to those in the atmosphere. (I realize I am saying the word “lungs” a lot). Once in the… lungs, air is transferred to the blood vessels and then the arteries, which delivers O2 to the body’s cells. The O2 is then used to make energy. As a by-product of this process, CO2 is produced, and carried back to the lungs via the veins. The N2 in the air is carried around the body as well. But as it is (mostly) inert, it is just circulated around until it reaches the lungs and is expelled along with the CO2. At the surface, the amount of N2 in the body remains constant. For anyone who has never been diving, that’s the end of the story. But as divers, this process gets more complicated as we descend underwater and atmospheric pressure increases. Simply stated, partial pressure is the pressure of a gas in a mixture of gases. Adding each individual pressure together will give you the total pressure. So for air at 30m (4ATA), the partial pressure of N2 is 4x 0.79= 3.16. The partial pressure of O2 is 4x 0.21= 0.84. Add those two answers together and you get 4ATA. The percentage of each gas stays the same, 79% for N2 and 21% for O2, but if the ambient pressure is higher, the partial pressure will also be higher. This is relevant because it’s how we track what’s happening with gases as they move around our bodies when we dive. We also commonly use millimetres of mercury (mmHg). Another gas law important to us is Henry’s law. But before we move on to that, let’s look again at the process of respiration in a little more detail. The air that enters our lungs moves down the trachea, and reaches two bronchi – one entering each lung. As the air moves deeper into the lungs the bronchi split into smaller branches, called bronchioles, which continue to branch out and get smaller. This increases the surface area available for gas exchange. At the end of these branches are millions of sacks, called alveoli, the lining of which form a surface (the alveolus) that allows gases to be transferred from the lungs to the bloodstream and back. Incredibly, the average person’s lungs contain around 600 million alveoli, which, if you could lay them out on the floor (and not die) would cover a surface area of 100 square meters! The alveolus is less than 1,000th of the thickness of a human hair, and each one is surrounded by fine capillaries carrying blood from the pulmonary artery. Apart from the fact that all of this is amazing, the really amazing part is that the walls of the alveoli, along with the surrounding capillaries are only one cell thick, and comprised of so-called epithelial (flattened) cells. This means that gases coming to and from the lungs only have to cover a very small distance, which increases the speed of gas exchange and makes respiration very efficient in a normal healthy body. It takes around 1 second for blood to travel through the lung capillaries, and in this time it becomes almost 100% saturated with oxygen, and at the same time the CO2 produced during metabolism of O2 is moved back to the lungs to be breathed out. “At a constant temperature, the amount of given gas dissolved in a given type and volume of liquid is directly proportional to the partial pressure of that gas in equilibrium with that liquid”. Translated into English, this means that the amount of gas that will dissolve into a fluid will increase as the partial pressure increases. So as we descend under the water and the partial pressure of gases in our lungs increases, more of this gas will dissolve in solution. However, different types of gases have different solubility, as do the different tissues of the body; another reason why deco theory is very complicated. But how do gases get into our body tissues beyond the blood? A common question during TDI decompression procedures courses. The answer is diffusion and perfusion. Diffusion is where a fluid (gas or liquid) will, by random motion of atoms, move from a high concentration gradient (of like-atoms), to a low concentration gradient. A classy analogy is dropping some ink into a tank of water (pictured above). You can see over time that the ink moves outwards until the water becomes pale blue, and the ink is uniformly distributed in the tank. A crude analogy is when someone farts in an elevator – same process, harder to demonstrate in open air spaces, or in front of your mother (not pictured). Gases dissolve into the blood in amounts determined by the interaction of Dalton’s law and Henry’s law. In the case of N2, the body is already saturated at sea level, so there is little diffusion occurring as the lungs, blood and tissues all contain equal amounts. The only significant exchange is O2 being transported to the tissues and metabolised, and CO2 being taken back to the lungs to be excreted. As deoxygenated blood travels back to the lungs the partial pressure is lower than in the alveoli (because some of the O2 has been used up by the body), so O2 diffuses into the blood. Likewise, CO2 diffuses out of the tissues (as a by-product of metabolism) and into the blood, to be taken to the lungs. The rate of gas exchange is described by Fick’s law, but there’s no need to go into that here. In essence, the lungs and bloodstream work in conjunction to ensure that the concentration gradient for O2 is such that it travels from the air to the blood, whilst CO2 will travel from blood to the air. As we descend during a dive (we’ll ignore helium for now), N2 comes into play as we increase this diffusion gradient – our lungs are at ambient pressure (at the depth we are at), so the partial pressure of each gas is higher. It is worth noting that increased partial pressure does not push gases into tissues like blowing up a tire. It’s the random action of like-atoms along a concentration gradient. This means that the rate of diffusion of a particular gas is not dependent on other gases in the tissue. So the movement of one gas is completely unaffected by the pressure gradient of another gas. This explains how O2 travels across the alveolar membrane into the blood, whilst simultaneously CO2 travels the opposite way. Their movement in opposing directions is completely unaffected by each other (not necessarily true of N2 and He- Isobaric counter diffusion, but that’s for another article). It’s all very well having gases diffuse in and out of tissues, but this happens over very small distances. So how does the entire body become affected by these gas exchanges? You’ve probably already guessed it, perfusion. Coming from the French verb “perfuser”, it means “to pour over or through”. It basically means blood flow, or the rate of blood flow. A terrible way of analogising how it works alongside diffusion is putting your trash out for the garbage collectors to take. That’s the diffusion bit- you only have to walk to the front of your house to dump it. You can produce as much trash as you like and leave it out on the street but if they don’t come and take it, the only thing that will happen is an unpleasant increase in the aroma of your street, and the loss of use of the pavement. Yet if they come and take it regularly then there’s no backlog and your street hopefully smells pleasant. Similarly, blood moves around the body, carrying gases from the lungs (picking up your trash) and transporting them into smaller and smaller capillaries, until these capillaries become only 1 cell thick, which allows oxygen to get to the tissues (the landfill site- I told you it was a terrible analogy). During diving, N2 dissolved in the blood is also able to efficiently diffuse into tissues via the same capillaries, because the tissue is being constantly supplied by gas-rich blood. Different tissues of the body are supplied with blood at different rates. The brain, blood, heart and muscle are well supplied, whereas bone, fat and cartilage are poorly supplied. For a given tissue, if the gas tension (a consequence of high partial pressures) of the N2 in the blood is higher than the gas tension in the tissue then N2 will diffuse into the tissue- this is the process of on-gassing. This is what happens on descent and during the bottom portion of a dive. During the ascent, the tissue tension may be higher than the blood tension, which means diffusion will occur in the opposite direction, taking N2 back to the lungs, which has a still lower partial pressure of N2 for a given tissue. Decompression theory, as it relates to actually going out and doing a dive, is all about quantifying this two-way exchange of gases, and ensuring that we do not exceed certain limits with regard to tissue tensions. How we control those limits directly relates to our allowed bottom times, maximum depth, and rate of ascent. This gets more complicated for technical diving, especially when we start going deeper, or longer, or both, using different gases such as trimix or heliox for the bottom portion of a dive, or hyperoxic mixtures to increase the rate of diffusion, or try to control the size and number of silent bubbles in the free phase in our bodies, in addition to the dissolved gas in our tissues. This article sets the scene for the next, in which I’ll take the on- and off-gasing process further and talk about saturation, supersaturation, critical supersaturation, M-values, half-times and inert gas gradients – all fancy terms, which will make more sense once I’ve written it! Powell, M. (2008). Deco for divers, published by Aquapress. Available on Amazon. Edmonds, C. McKenzie, B, Thomas, R. Pennefather, J. (2013), Diving medicine for scuba divers, 5th edition. Vorosmarti, J, & Vann, R. Physics, physiology and medicine of diving.